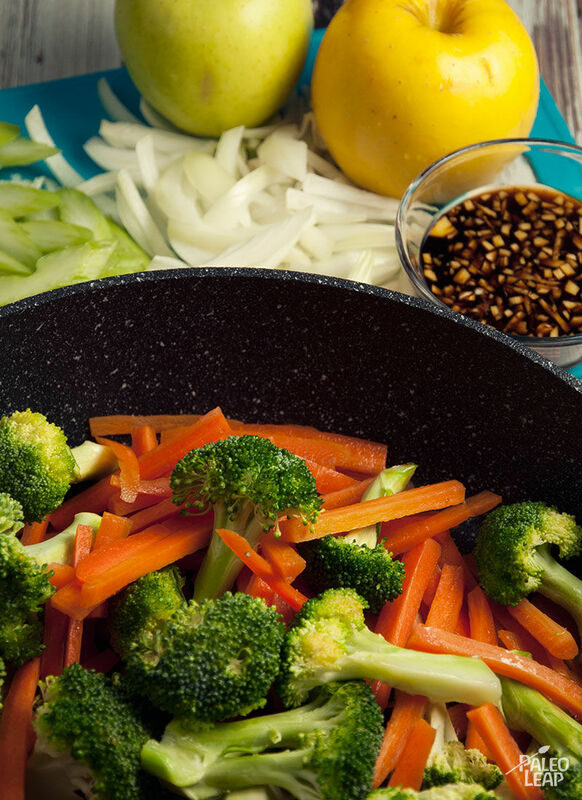 An apple isn’t first ingredient that typically comes to mind for a stir-fry, but the sweetness actually goes very well with the vegetables here, and it’s just different enough to make a nice change from the usual vegetable rotation. A gingery orange sauce pulls everything together – it’s a great side dish for all kinds of meals, and so easy to throw together. 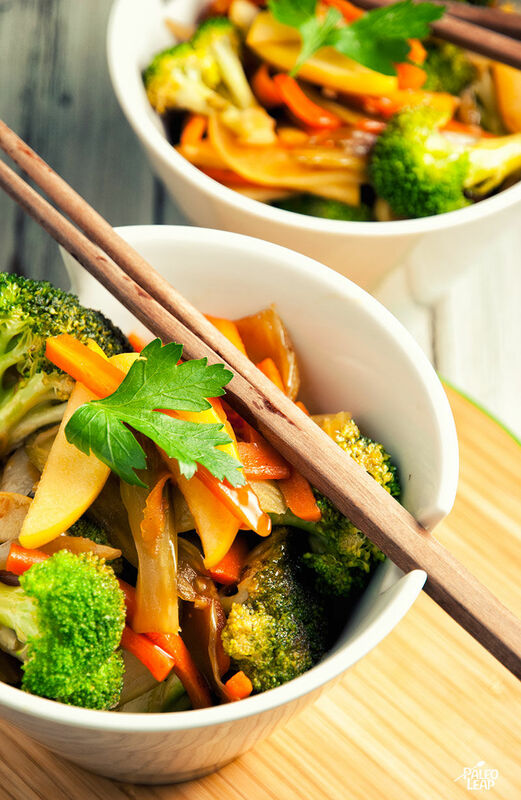 It’s a perfect example of how simple concepts like a stir-fry can be tweaked to make all kinds of interesting flavors without adding a lot of extra work. The sauce in this recipe uses coconut aminos – that’s a Paleo-friendly substitute for soy sauce that you can get at health-food stores or online. For the fish sauce, any brand is fine; just check the ingredients as always for hidden sugar or other junk. This would be tasty with any kind of Asian-inspired main dish (Korean short ribs, anyone?). And if you’re looking for dinner and not just a side, you could easily add a few chopped chicken breasts to transform this from a side dish into a full meal. Combine all the ingredients for the sauce in a large bowl. Heat a skillet over medium-high heat and melt some cooking fat. Add the broccoli and carrot and cook until tender but still somewhat crunchy, about 5 minutes. Add the onion and celery and cook for another 5 minutes. Drizzle the sauce over the mixture, and cook for 2 to 3 minutes. Add the apple, stir everything, cook for another 2 to 3 minutes, and serve.